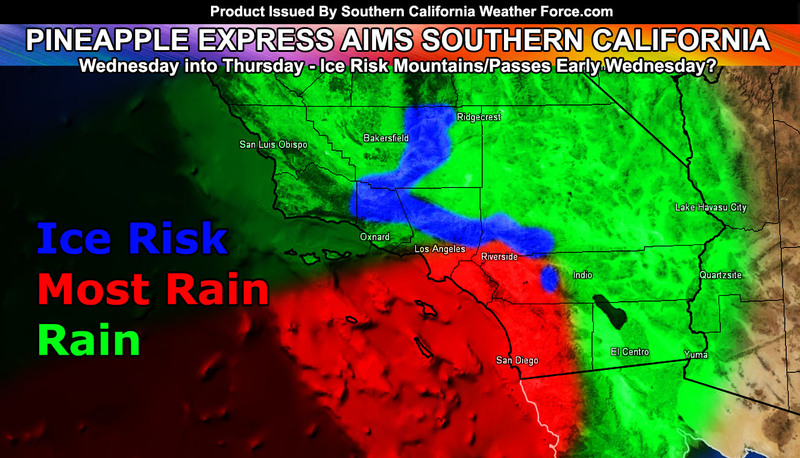 Well we are about two days away from the next rain event for Southern California. Numbers are all over the place in rain amounts. Some numbers on the low end and some on the high end. I’d really like to keep the higher end numbers with a better target for higher rainfall rains for the south and west slopes of the San Bernardino, Riverside, and San Diego Mountains, including the Inland Empire and San Diego County areas. This type of flow is west-southwest to east-northeast and without a major southerly flow component I would say that San Diego County may stand the best chance at having the most rainfall when this is all over. Storm is expected to make its way into the area on Wednesday morning. Just before the tropical air-mass at the surface moves in, freezing air at the surface in the mountains and passes may actually contribute to an ice storm problem. These values are not good at all if they come true. Many may actually be driving unknowingly between the hours of 6am and 10am Wednesday morning into a full ice storm that will cause a lot of ‘accidents’, maybe even some cars rolling down the mountain side. I have issued an Ice Storm Watch as a result. I will need another day to determine if this needs to be an Ice Storm Warning, but my models (not visible to the public until Tuesday evening) are hinting at a deadly scenario that will catch everyone who isn’t watching this site off guard. This, with multiple freezing levels will make for rain falling. Since the ground would be freezing we could see this turn into ice instantly, including the I-15 zones of the Cajon Pass, which had something similar on Christmas Morning that caused a major pile-up. These scenarios are very rare for our area. In the Midwest, freezing surface temperatures and rain overspreading the area results in the same conditions for a few hours. IF this happens it will only last for 1-3 hours before the surface temperatures rise due to the incoming tropical air-mass. A very complicated forecast ahead for me. An Ice Storm Watch means conditions are favorable in and around the watch area for an Ice Storm Warning to be issued. IF conditions warrant a full Ice Storm Warning, it will be issued as the final product. For now I will leave this as a caution ‘watch’ so that I can address it more on Tuesday afternoon and evening to see if it needs to finalize as a warning. Snow levels after 10am on Wednesday morning will surge up through 8,000 FT and eventually to over 10,000 FT for the rest of the Wednesday and Thursday period. This article is just a preliminary assessment on what I have so far. I will finalize the rest on Tuesday evening, including the need to continue an ice storm product. Because of the surface low near San Francisco being strong, gusty wind conditions are possible and as stated in the previous update, we could see southeasterly winds along the coast and this could bring ‘slightly’ drier low levels west of Los Angeles. Will monitor everything as this is a complicated pattern to work with, especially the mountain/pass danger. As always, stay tuned to Southern California Weather Force for further details.